For a very long time, I exercised without the aid of an MP3 player. My reasons were many: I thought it would be distracting … thought it would be unsafe (when walking outdoors) … thought it would be too much hassle to remember to pack one more thing in my gym bag … thought it wouldn’t make any difference to my workouts. Five years ago, some of my best marathon buddies surprised me with the gift of an iPod, plus CDs of their favorite walking music. So I loaded the CDs onto the iPod and hit the pavement. Wow! I didn’t pay any attention to how much time I was out walking and instead eagerly awaited the next song and its tempo, enjoying the boost in energy the music gave me. Then I used my iPod while on the treadmill. Suddenly I noticed how certain songs aligned with certain treadmill speeds. I realized I could make a whole playlist of songs whose tempo matched my usual speed — or my desired speed — and customize my workouts. For several of my next treadmill sessions, I scribbled down songs and their corresponding speeds. Then I found websites that listed songs’ beats per minute, or BPM. 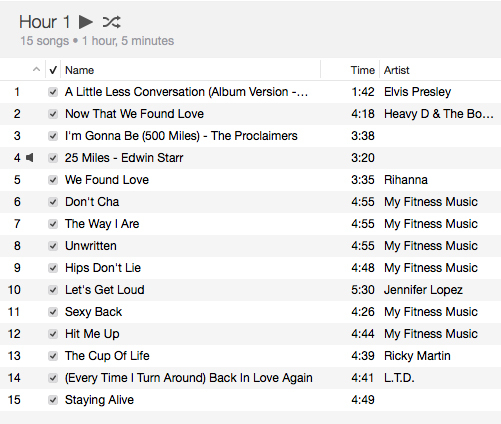 That enabled me to match songs to treadmill/walking speeds and find songs that best worked for me. The next step: putting together a few different playlists of different lengths, including slower warm-up and cool-down time. The research results are varied in terms of measuring the exact effects — but it’s clear that choosing music that moves you can, well, help you move. Here is one of my most-used playlists, which I created for walking. It’s about an hour long, starts and ends at about 3.5 or 3.6 mph, and peaks at about 4.1 or 4.2 mph. It’s a mix of a few songs from those original CDs from my race pals, some songs from instructor CDs, and a few tunes that caught my ear as having a good beat or feeling inspiring. Thanks to loyal WWJ reader Lauren Z. for this post idea! This entry was posted in About me, Advice and tagged beats per minute, BPM, exercise, inspiring music, iPod, motivating music, MP3, music, workout music, workouts by Walk With Joelle. Bookmark the permalink. While I enjoy exercising to music I still prefer to distance walk without background noise. My life is so loud and filled with noise that taking a long walk and enjoying the quiet is wonderful. I guess everyone has to decide for themselves; but for me…… no music, no cell phone, no one calling my name. Blissfully walking along in silence. I don’t disagree, Pat — on long training walks for races, which I often do very early in the morning, I do like to be out in the still-quiet world without any enhancement. Love this post and thank you for sharing your playlist! 🙂 The only thing that gets me through working out is music. If I don’t have music, I don’t work out! Love your playlist- some great ideas! At the gym I have been listening to podcasts and audio books. Getting lost in a good story or interesting topic definitely helps pass the time on the dreadmill. The machine keeps me up to speed and I can usually still hear the beat of the piped in gym music. Still like the audio motivation when I’m on the street- and it somehow helps quiet my mind.